with Guido Martínez, and Guido De Luca. Haskell 2018. I am or I've been on the PC of Haskell 2018, MSFP 2018, TFP 2018, TFP 2017, CLEI 2017 (Simposio Teoría Computacional), IFL 2016, IFL 2015, CLEI 2015 (Simposio Teoría Computacional), EST (JAIIO 2015), WGP 2015, TLCA 2015, Haskell 2014, CLEI 2014 (Simposio Teoría Computacional), IFL 2013, ICFP 2013, CLEI 2013, IFL 2012, TFP 2011, OpenCert 2011, MSFP 2010, and EST (JAIIO 2010). "Database Systems" and "Unix and Software Tools" at the University of Nottingham Ningbo, China. Martín Ceresa and Guido Martínez are currently doing their PhD under my supervision. I've supervised the doctoral thesis of Exequiel Rivas. Pablo Buiras, supervised by Alejandro Díaz-Caro. Germán A. Delbianco, supervised by Alberto Pardo. 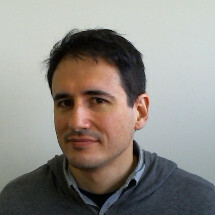 Martín Ceresa, co-supervised by Exequiel Rivas. Ezequiel Postan, supervised by Exequiel Rivas. I finished my Phd on September 2009 after defending my thesis on "Lifting of Operations in Modular Monadic Semantics", under the supervision of Graham Hutton and Neil Ghani, working with the Functional Programming Laboratory , at the University of Nottingham. I obtained a Licenciateship in Computer Science at FCEIA - Universidad Nacional de Rosario in Argentina on December 2004. Before that, I studied Electronic Engineering. My graduate thesis on generic accumulations has been published by the University press and it's available for download (PS/PDF). My graduate thesis supervisor was Alberto Pardo. During the first semester of 2005 I did an internship at Loria, where I verified Disk Paxos using Isabelle. A technical report and the complete proofs are published in the Archive of Formal Proofs.